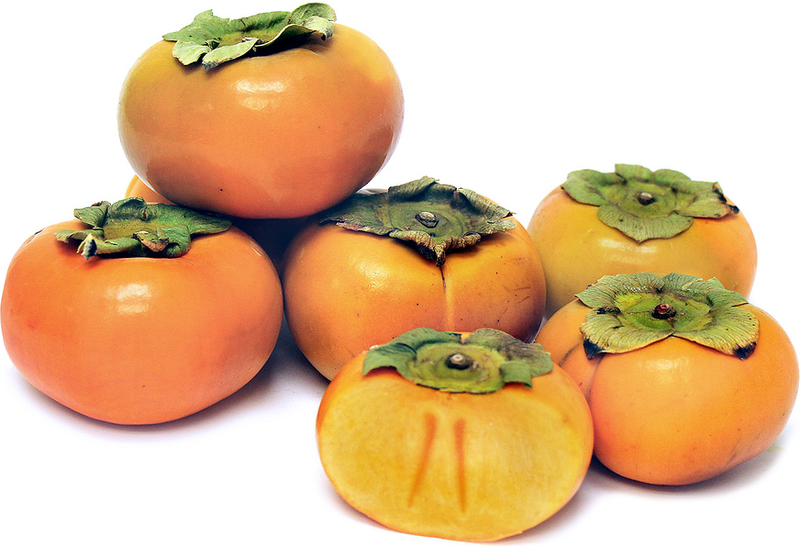 Somewhat resembling a tomato, Fuyu persimmons have a thin reddish-orange skin and soft flesh. Ripe fruit offers a pleasant, spicy, sweet flavor and is tannin-free. Described as having a flavor compared to a blend of mango and papaya, some say it has an apricot overtone. Others say it tastes like an apple and orange mixed together. Whether it is crisp-hard or just slightly soft, this persimmon is ready to be enjoyed. The flatter and crisper Fuyu variety is one of the most popular persimmons available. Absolutely succulent, this tasty fruit is a welcomed sight to its addicted fans. Locally grown California Persimmons are available fall through early winter. Having a peak season October to late December, Fuyu Persimmons make sporadic appearances throughout the year. The Fuyu variety, the slightly oval Hachiya and the Tanenashi are the most frequently seen persimmons in our markets today. A rare non-astringent variety of the persimmon is from Israel's Sharon Valley and is named the Sharon persimmon. This improved variety has no core, is seedless and contains no tannin. Persimmons offer an excellent source of fiber and contain lots of vitamin A, plus are a good source of vitamin C. Practically fat-free, persimmons are sodium-free. Fully ripened persimmons are excellent eaten alone and are absolutely delicious made into sherbets, puddings, jams, purees, breads, ice creams, stewed fruits, cakes and other baked goods. Locally grown in California and located right in the middle of the very best fruit-growing region in the nation, Penryn Orchard Specialties is renowned for its biodiversity and proudly promotes natural ecological forces to do the necessary work.